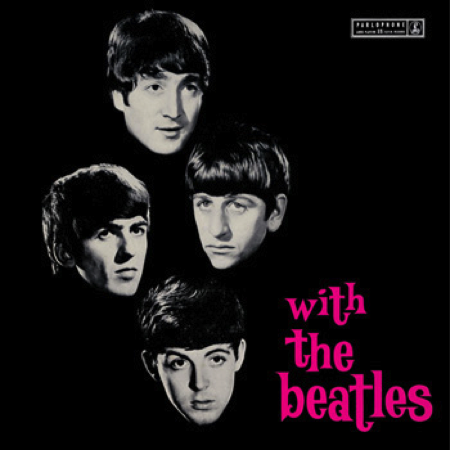 “With The Beatles” is the second studio album by the Beatles. It was released on 22 November 1963, on Parlophone, and was recorded four months after the band’s debut “Please Please Me”. The album features eight original compositions (seven by Lennon–McCartney and “Don’t Bother Me”, George Harrison’s first recorded solo composition and his first released on a Beatles album) and six covers (mostly of Motown and R&B hits). It remained at the top of the charts for 21 weeks, displacing Please Please Me, so that the Beatles occupied the top spot for 51 consecutive weeks. In 2003, the album was ranked number 420 on Rolling Stone magazine’s list of the 500 greatest albums of all time. The album became the first Beatles album released in North America when it was released in Canada on 25 November under the augmented title Beatlemania! With the Beatles, with additional text on the album cover, and issued only in mono at the time, catalogue number T 6051 (a stereo Canadian release would come in 1968, catalogue number ST 6051). With The Beatles was unevenly “split” over the group’s first two Capitol albums in the United States; nine tracks were issued on Meet the Beatles! (the eight original compositions plus “Till There Was You”), and the remaining five, all “covers”, were placed on The Beatles’ Second Album. The LP had advance orders of a half million and sold another half million by September 1965, making it the second album to sell a million copies in the United Kingdom, after the soundtrack to the 1958 film South Pacific. With the Beatles remained at the top of the charts for 21 weeks, displacing Please Please Me, so that the Beatles occupied the top spot for 51 consecutive weeks. It even reached number 11 in the “singles charts” (because at the time UK charts counted all records sold, regardless of format). EMI Australia did not receive the cover art, and used alternate shots of the band in a similar style to the black-and-white photograph on other releases. The Beatles were unaware of this until fans showed them the cover during their only Australian tour, and informed the EMI publicity staff that they were not pleased with the substitution.